The Kudowa Summer School "Towards Fusion Energy" takes place every two years in Kudowa Zdrój, Poland. 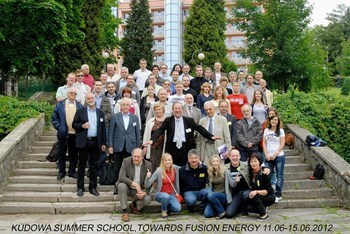 Organized by the Institute of Plasma Physics and Laser Microfusion (IPPLM) and the International Centre for Dense Magnetised Plasma (ICDMP), the summer program is geared toward a multinational audience, principally PhD students but also Master's students and young scientists from all over Europe. The next session will take place in 2020. Watch this space for more details.